JotForm 4.0 lets you build forms on any device, so you can create beautiful forms in less time and be more productive. Create, edit and publish online forms from any smartphone or tablet. JotForm is the first online form builder to be compatible with all mobile devices. Multiple team members can simultaneously work on the same form. Changes are automatically uploaded so you always edit the most current version. The Form Designer and Theme Store are now embedded directly in the form builder. 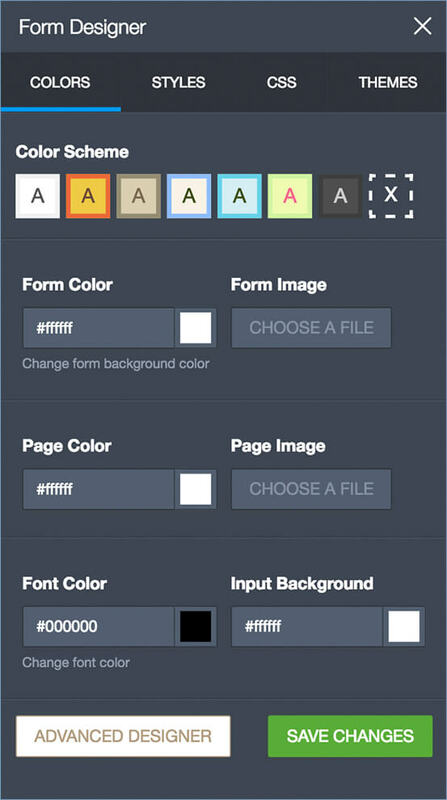 Change the form theme and adjust design attributes without navigating to a different page. JotForm 4.0 has many new and exciting features to help you create beautiful forms. Continue editing a form even without internet access. All of your edits will automatically be uploaded once you return online. Dragging form fields has been improved for smoother experience, including between different pages in a single form. Users can view a history of revisions made to any form and easily revert back to a previous version with a single click. With this update, form previews now display in the same window in their full size, and can be toggled on and off with a single click. After a change is made, the form automatically saves, eliminating the need to manually click a button each time. Users no longer have to worry about losing any edits. Instead of adding a Page Break field to separate a form into multiple pages, users can now add new pages to their forms with a single click.